The Factor Game is a fun, interactive game that exercises your factoring ability. You can play against the computer or against a friend. Player A chooses a number on the game board by clicking on it. The square will be colored blue, as shown for 12. Player B then clicks on all the proper factors of Player A’s number. For example, the proper factors of 12 are 1, 2, 3, 4, and 6.
as shown to the left. and Player A colors all the factors of the number that are not already colored. The players take turns choosing numbers and coloring factors. that player loses a turn and does not get the points for the number selected. 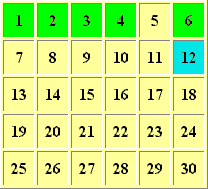 The game ends when there are no numbers remaining with uncolored factors. Each player adds the numbers that are colored with his or her color. The player with the greater total is the winner.